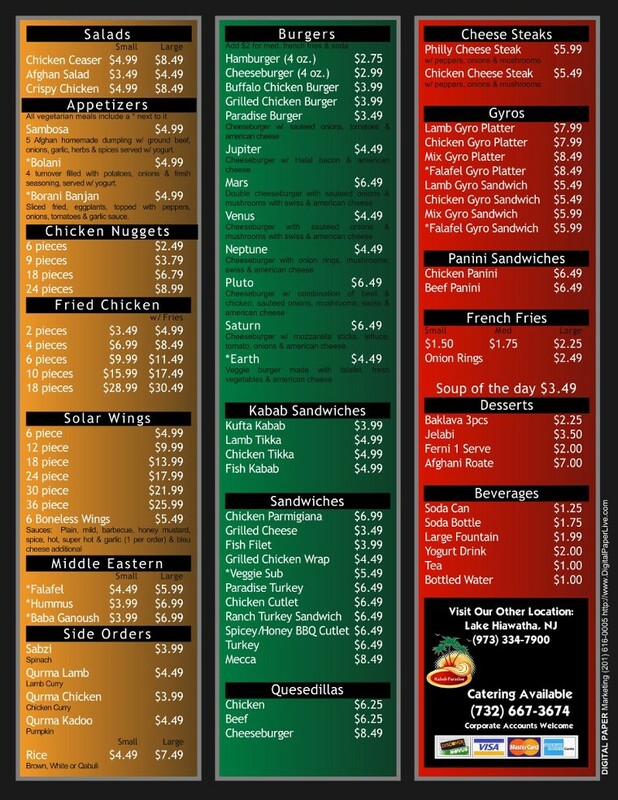 Kabab Paradise is a great place! It’s a small place, but they have a lot of seating. 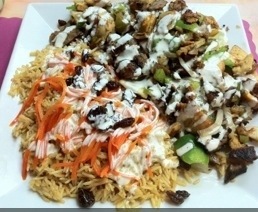 The mix gyro platter is amazing! The lamb tikka kabab is good! 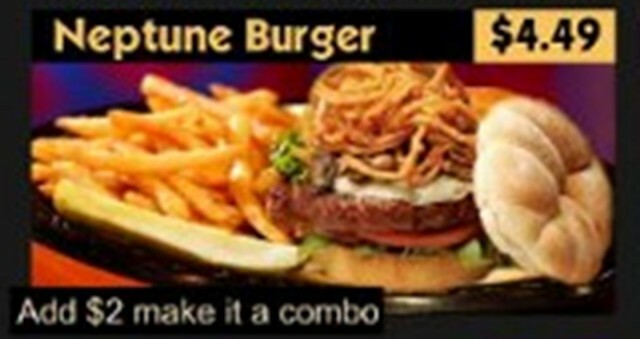 The Neptune burger was great and interesting! Different from a traditional burger (It’s the Halal Meat!). I had a side of lamb qurma it was nice, watch the bones! For dessert I had the Firni it is an amazing pudding with an unusual layered flavor profile, like nothing you have ever tasted! Similar to Indian Kheer minus the rice, but with much more spices. For $2.00 a portion you can’t go wrong!! A must buy! Afghan firni is a light, silky pudding of milk and starch flavored with rosewater, cardamon, and pistachios (some Indian versions apply the same flavors to a rice pudding base). 3 times in one week I’ve been here because the food is on the eat right for your bloodtype diet, I just have them substitute salad for the rice and bread. Today I am having Chapli Kabab which is beef and Qurma Kadoo which is something with pumpkin kinda like a pumpkin sauce to dip into bread but I’m not eating the bread. Oh now that’s what I’m talking about! The Chapli kabab is perfect a tad spicy and great taste just tell them to hold the pita naan, and you have a perfect low carb nutritious meal. The pumpkin dish was incredible I first thought it was weird that they put a drizzle of the tzatziki sauce on the pumpkin but it enhanced the dish and layered the flavors! 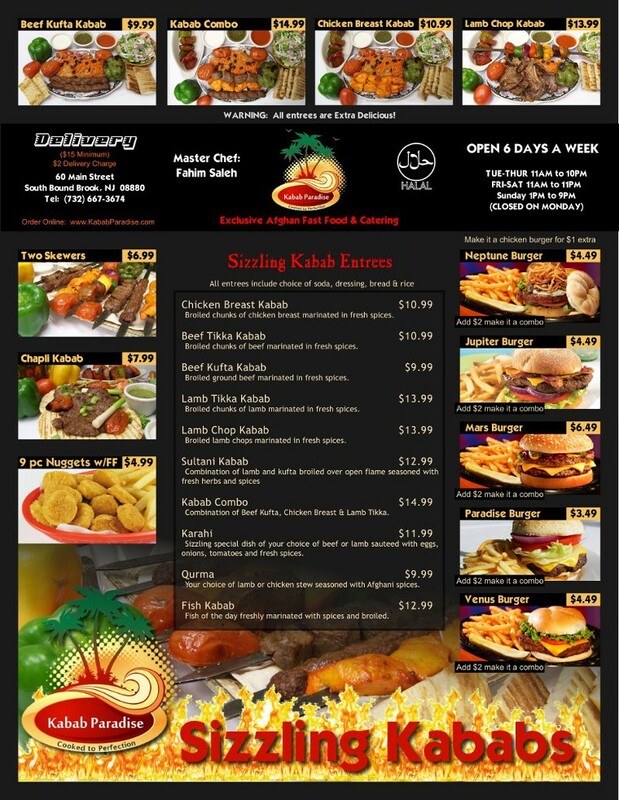 You have to go to Kabab Palace! Check it out! Copyright © 2011 louisjbianco All Rights Reserved. Easy Thai Peanut Sauce – great for satay, Asian finger foods, or a vegetable platter! Thai Peanut Sauce (Satay Sauce), Great for Dipping or Marinating! marinade over night, in the morning mix up the marinade move the ribs around, continue to marinade until you are ready to grill. Place ribs on grill: when you turn ribs over brush with marinade again then allow to cook fully do not brush after that point, remember you are cooking pork and the marinade had raw pork in it. Of course like most of my meals: if you want heat: jack up the hot sauce!! Once fully cooked add reserve sauce if you want, serve and enjoy! 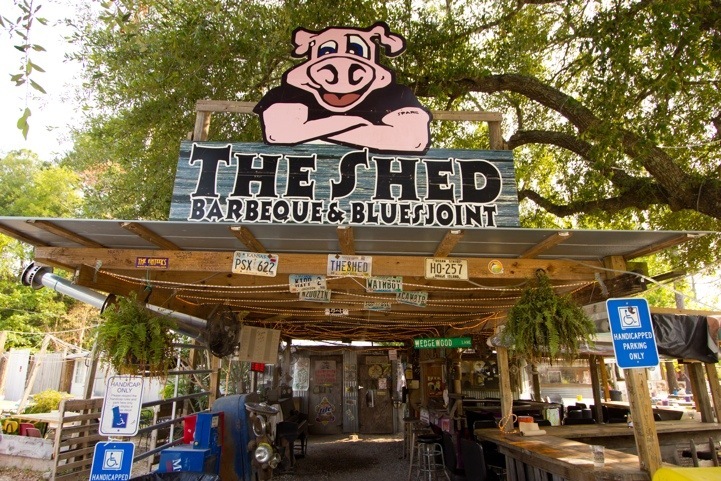 Restaurant Review: The Shed BBQ – Ocean Springs, MS the Best BBQ!! The Original Shed is located in Ocean Springs, Mississippi. Within the last two years The Shed has not only grown in size but there are now five other Sheds in the Southeast covering a five state area from Louisiana to Florida. No cookie cutter franchise going on at The Shed! No two Shed’s are alike. They all have their own personality though keeping the ambiance of the Original Shed while masterfully keeping the quality and quantity of their nationally award winning Shed food. So folks, that’s the true story of The Shed…couldn’t make it up any better. If you’re as crazy as the rest of us and want to jump on board with a Shed of your own just give Brad 228-297-2723 or Brooke 228-297-2628 a call. Better buy one now before your neighbor does! This place is hands down the best BBQ in the south!! Everything just disintegrates off the bone without even touching it. The brisket is worth killing for! (be careful I have a CCW) Don’t try to grab my Jumbo Sampler!! This is slow cooked smoked meat at it best! The homemade BBQ Sauces rock!! I go for the hottest every-time! The menu is quite large, but the jumbo sampler is all you ever need! Whether you eat it all at once or it lasts you a few days, the price and quality can not be beat!! 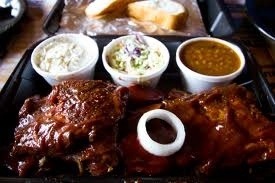 Our menu is 100% Old School, Sweet Southern, Down-home BBQ. We use the very best products available today and our pecan wood-burning smokers make it just right. Prices may vary slightly from location to location. Trust me you will be addicted! 9-12 per pound depending on the chicken! Tomatoes, Black Olives, Jalapenos and served with sour cream. Nice big potato smothered with butter, good shredded cheese, and your choice of Beef, Pork or Chicken, some ShedSpred and a pack of sour cream. Delicious recipe from G-Maw’s box. Baked beans with onion, bacon, bell pepper and seasonings. A dreamy, creamy slaw made with our special slaw sauce. Large shell macaronis, onion, bellpepper, shredded cheese, seasonings and our Mac sauce. Yum! Twice baked potatoes, onion, bacon in a sour cream and mayo base. SANDWICHES / ADD $4.00 AND MAKE YOUR SANDWICH A PLATE WITH 2 SIDES! This is the one that won the Ultimate Hometown Grill Off on Regis and Kelly! ¼ lb $4.99 …..1/2 lb $5.99 add Slaw Topper for 75 cents. Slow Smoked and “really” good! ¼ lb $5.99……1/2 lb. $6.99 Add Slaw Topper for 75 cents. Romaine lettuce blend, sharp cheddar, red onion, bell pepper, tomato, cucumber, large crispy croutons. Sandwich and 1 Bag of Chips OR your choice of 1 Meat and 2 sides. Beef, Pork, Wangs or Sausage. I wasn’t going to post this, because it is locational, but this place rocks soooooo much! 2. Not fancy, just amazing healthy food! 3. Amazing Rotisserie chicken, and the ribs are incredible! 4. The combo at $12-13 is crazy! I honestly don’t know how they can afford to give away all that food for only $12. I am serious!! 5. Make it healthy by requesting salad and black beans instead of rice and French fries. 6. The size is crazy!! You get a giant oval metal platter piled with food, enough for two meals unless you are a big guy like me then it’s one big stuffed meal! 8. The owner is a super friendly extremely kind older man. His English isn’t very good, but he’s so nice! 9. The staff is friendly and speak: Portuguese, Spanish and English. You will love this place! If you live far, it’s worth the drive! I promise you! We serve Orders in and take out!